College isn’t about getting a job; it’s about earning a degree. So, when do students learn how to find meaningful employment? 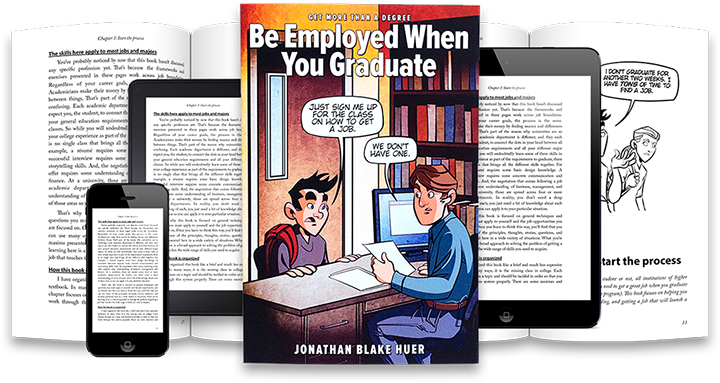 From choosing a major to negotiating a job offer, author and educator, Jonathan Blake Huer, offers his perspective to finding your way through today's job market in his first book, Be Employed When You Graduate. The advice and exercises in each chapter offer an honest and practical guide to setting measurable professional goals in college, and how to transform those experiences into internships, freelance positions and post-graduate jobs. Chapter 11: You have your First job. Now what? Chapter 12: What about grad school?